The Yen Tu Spring Festival will open on February 25 (the 10th day of the Lunar New Year), in Uong Bi city, the northern province of Quang Ninh, kicking off the National Tourism Year hosted by the locality. Key events held within the festival include the opening ceremony, Cherry Blossom and Yen Tu yellow apricot blossom festival and Hang Son Pagoda Festival. This year, Uong Bi city will work to ensure social order and traffic safety and prevent fire and explosion. Kiosks will be arranged to introduce tourism products and services to visitors. In preparation for the festival, investments have been made in infrastructure in the Yen Tu spiritual tourism site, including the upgrade of the road to Yen Tu relic site and the construction of a new cable car system to prevent traffic congestion. The province is also working to complete the first phase of the Yen Tu festival tourism services centre, which features Truc Lam palace, a Zen village, a pilgrimage village and the King monk Tran Nhan Tong museum. Yen Tu Mountain is located about 50 kilometres from Ha Long City. The area has awe-inspiring scenery, surrounded by ancient pagodas and hermitages. Tran Nhan Tong (1258-1308), the third King of the Tran dynasty, ascended to the throne when he was just 21. He is famed for defeating Mongol invaders twice during his 15-year reign. The King abdicated when he was 35 and spent the rest of his life on Yen Tu Mountain practicing and propagating Buddhism. He founded the first Vietnamese School of Buddhism called “Thien Tong” or Truc Lam Yen Tu Zen on the 1,068m-high Yen Tu Mountain. 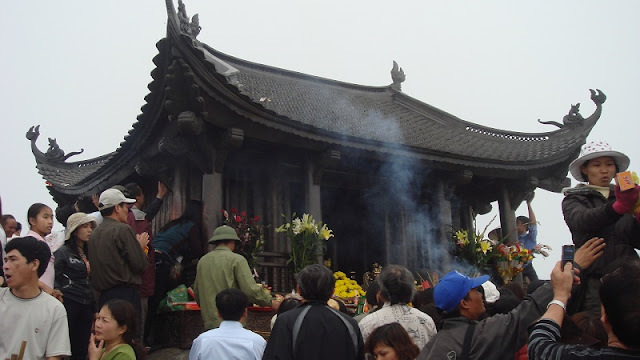 The 20,000ha site is considered the capital of Vietnamese Buddhism. Yen Tu became a major Buddhist Centre and King Tran Nhan Tong became its first leader under the religious name Dieu Ngu Giac Hoang Tran Nhan Tong. He ordered the construction of hundreds of religious buildings on Yen Tu Mountains for teaching and following a religious life. Thinking of where to stay in Hoi An? Huge fried rice ball - name anyone? Which month is the best to trek in Sapa? What is Ta Van Village in Sapa? Leave Sapa, remember to barbecue ! What do you do in Northern Vietnam for 6 days?